The ad for the new Real Wealth Strategist hints that we can "Make 3,000% Gains on the Commodity Trade of a Lifetime" -- what is it? Matt Badiali didn’t disappear from the newsletter firmament for very long –for many years he was the name behind Stansberry’s Resource Report (which was also called the Oil Report for a while), but he disappeared from that masthead a little while back… only to reappear in essentially the same role at Banyan Hill Publishing (which, like Stansberry, is part of the Agora family of publishers), helming an entry-level natural resources investment advisory. This time around it’s called Real Wealth Strategist, and they’ve launched quickly — Badiali’s hiring was announced in early March, and here they are already with a superheated hype-fest of an ad campaign to recruit his first wave of subscribers. So… step one. What’s the “magic metal?” Ready? “It’s not silver, platinum or any other precious metal. “It’s not aluminum, nickel, iron ore or lithium, either. “In short, it’s a ‘magical’ metal with unheard of superpowers that other metals simply don’t have. It even has miraculous medicinal powers. “Scientists are using it to fight diabetes, depression, low blood pressure, hair loss and fatigue. It aids in weight loss, improves vision and it can even protect you against many kinds of cancer. “Hence, this “magical” metal is worth billions, maybe even trillions, to pharmaceutical companies like Pfizer, Merck, Johnson & Johnson and Bristol-Myers Squibb, to name a few. And, of course, there’s a BIG SCARY SHORTAGE COMING! “… there’s one giant, ugly problem. “… demand is surging as America’s biggest companies scramble to secure more of this ‘magic’ metal. “… no new major deposits of this metal have been discovered since 1990. “In 2016, demand exceeded the mined supply by 1.4 million metric tons. “In 4 years, that shortage will surge to 4 million tons. “The United States Geological Survey recently concluded that there’s only enough reserves of this metal left to last 15 more years. That’s especially frightening when you consider demand could outpace supply by as much as 900%. “Mark my words, this metal will become the most fought-over, and sought-after, commodity on the planet. More than land, more than water, more than gold and more than oil. Really? We can’t just stick with, “prices will go up?” We have to go to wars and bloodshed? OK, fine, I guess humans will fight over everything… but if I ever finish that time machine and get to jump forward to 2050, I’m guessing I won’t be seeing an entry in the history books about the Great Zinc Wars of the 2020s. So the shorthand way of saying that is, “zinc demand is overwhelmingly an industrial story.” If we have big infrastructure investments and lots of construction and economic activity, there’s more zinc demand… mostly because of galvanizing. “And I can tell you with absolute certainty that this shortage is getting worse; there’s no way to turn the supply spigot on. It’s gone from 1.2 million tons to less than 480,000 tons. That’s a 50% drop in the last 4 years. “50% of ALL the ‘magic’ metal mined each year is used in galvanizing … the process used to coat iron and steel to prevent it from rusting. “… a small group of exploration geologists have struck the mother lode. It’s the first major deposit of this scarce metal discovered in the decades, and perhaps the last. This one deposit is so big it could solve the shortage crisis. OK… what other clues do we get about this company? Well, we’re told that it’s a “$2 billion North American company.” So that should ring a few alarm bells… if you’re going to grow your money 30-fold from this one, that means you think this company — presumably because of some zinc mine — is going to grow to be worth $60 billion. That’s not impossible, but it would make this one of the largest miners in the world (only BHP Billiton and Rio Tinto are larger than that among the corps of publicly traded miners). So we should probably cool our jets a little bit at this point and downgrade our expectations — it’s a lot easier for a little $20 million junior explorer with a surprisingly fantastic discovery to grow in value by 30X (which would bring the market cap just up to $600 million, which isn’t so huge), than it is for a real operating miner that already has a $2 billion valuation to show that kind of explosive growth. What else do we learn about this company? “… at the forefront of the battle to secure supplies is this innovative $2 billion mining firm that’s about to leapfrog its way onto the scene in a big way. OK, so if they’re “ramping up production” this is not a brand new discovery — that means someone probably identified the zinc (or whatever other metal they’re also finding in the mine) at least several years ago… building a mine isn’t quick or easy. “While most of the world’s largest deposits of this ‘magic’ metal are in Australia, India, Mexico, Peru and Sweden … this mining outfit is in an unlikely place … just north of the U.S. border. “The surest way to ‘magic’ metal riches is to invest in the mining pioneer sitting on 22 million tons of recoverable reserves of gold, silver, and, of course, this “magic” metal in its mine. And we get some photos of the mine operations that will help to confirm the Thinkolator’s answers… so I can tell you, dearest readers, that this “Magic” Metal miner is… Hudbay Minerals (HBM in both Toronto and NY). Hudbay has operations in both Peru and Canada, but the mine being teased here is their operation in Manitoba — the zinc “discovery” is presumably a reference to what is now the Lalor mine, a zinc deposit found in 2007, though their long-producing 777 mine is also a big zinc producer (777 is closing in on the end of its mine life in 2020, though they might find more reserves to extend that… Lalor, which is a couple hundred kilometers away, just got to commercial production a couple years ago and is expanding zinc production). The photos that Badiali borrows for his presentation are, at least in one case I can confirm, of the 777 mine. You can see Hudbay’s “key facts” on the Lalor mine here — they treat it as a primary zinc mine, with the copper and gold “byproduct credits” meaning that the cash cost per pound of zinc is negative seven cents. If they produce 59,000 tonnes of zinc per year, as planned, then that means it’s essentially all profit on a cash basis (meaning they’re not accounting for the capital expenses, probably). 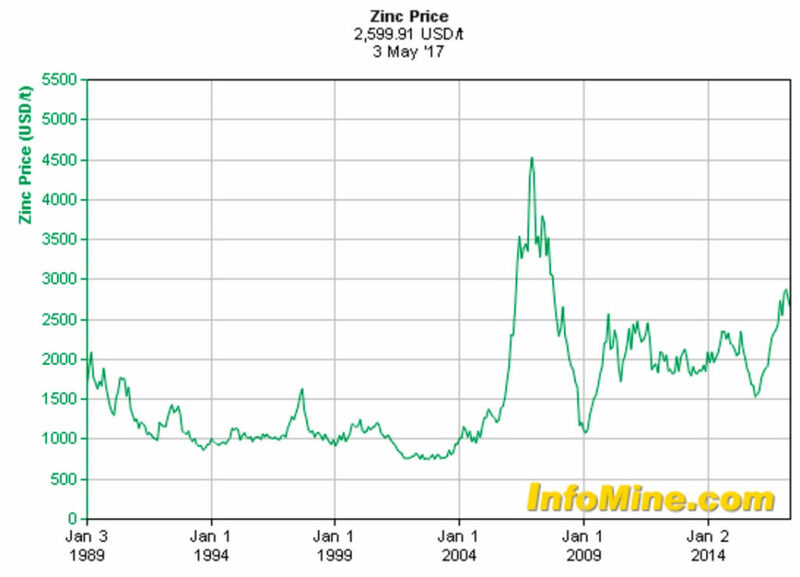 Zinc is at about $1.20/pound now, and a metric tonne is about 2,200 pounds, so that means the cash flow potential from Lalor might be a bit over $155 million. Assuming I did my math properly. What will that mean for Hudbay? Well, maybe not all that much — their revenue is coming in at about $1.5 billion/year on an annualized basis right now. $150 million is still a lot, since margins are generally not so great for mining — operating cash flow for the past three months for the whole copmany, including Lalor and 777 but also their Peruvian mines, was only about $80 million. That’s with 26,000 tonnes of zinc sold in the quarter, which is close to their plan for 777 and Lalor (together those would be, according to the basic facts on the website, producing about 114,000 tonnes/year), so there’s not some magical exponential increase in zinc production coming — they are trying to ramp up zinc production by a meaningful amount. Hudbay does have some analyst coverage, and they predict about 90 cents in earnings this year, followed by $1.05 in 2018 and $1.54 in 2019. 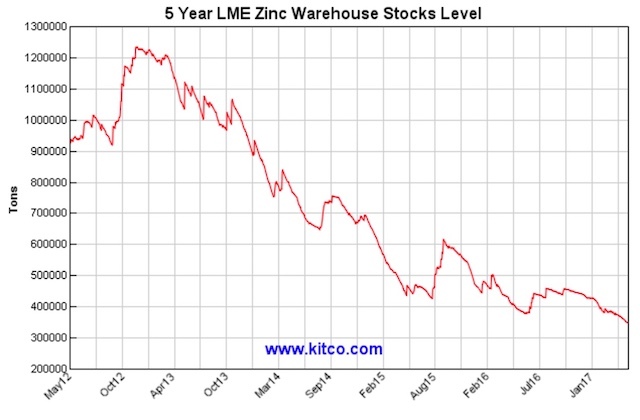 Presumably that’s based on zinc to some degree, though I don’t know what prices the analysts use. It’s a solid company, with the primary weight on their shoulders being the aging of the 777 mine… if that mine really shuts down in 2020 and they don’t find more local reserves, their revenues will take a big hit in the early part of the next decade. And yes, Hudbay has been around and producing for a very long time. If you’re checking on those other clues, they did just get a new CEO, internally promoted, in 2016, and he is a 30-year mining veteran — that’s Alan Hair… and Lalor (in Snow Lake) and 777 (in Flin Flon) are both “just north of the U.S. border,” as long as you use the term “just north” like the folks who are used to rural Western living and might drive for a couple hours to get groceries… they’re roughly in the middle of Manitoba if you’re going from South to North, about 500 miles from the North Dakota border. Will Hudbay soar on a rise in zinc prices? Well, it would probably help a lot. Copper and gold and silver are all important as well, with copper probably providing at least as much leverage as zinc when it comes to Hudbay’s revenues… so really, it’s a pretty solid exposure to basic metals, and that means it’s pretty solid exposure to global infrastructure spending, particularly in China. If that picks up, zinc and copper prices will rise and Hudbay’s earnings should rise quickly, which should boost the share price. If China sinks into recession and copper falls a dollar and zinc stays steady, things will be much less pretty. And no, I don’t see any meaningful way for them to grow by 3,000% — unless you’re talking about a 20-year period that includes them making a bunch more discoveries along the way. Mining is not scalable, you’ve got to have the deposits and you’ve got to produce them, which means moving tonnes and tonnes of rock, and it takes a long time to develop and improve mines. If copper rises nicely and zinc goes to $3 a pound, though, their earnings could easily double or triple, and as long as people don’t start to panic about 777 closing down that ought to boost the share price considerably. I’m no expert on Hudbay, that’s just what I can garner from an hour or two with their presentations this afternoon. If you’ve got some perspective on Hudbay, or on zinc, or on whatever else, feel free to unleash it upon us with a comment below. Thanks! 117 Comments on "What’s Matt Badiali’s “Magic Metal” Pitch About?" Even if china economy pulls back cant the develpment of AFRica and india and Parts of Asia drived commodity prices? Is Zinc also referred to as the “blue gold” as was recently touted by “Keith Kohl” of Angel Publishing promoting his Pure Energy Trader subscription? I bought HUDBAY on Badiali’s recommendation and I am up about 50%,. Most picks of his I bought have done well. I recommend his service. That’s great to hear jamanwin. Thanks for yur input. Gives a little more confidence in Badiali. Did you hear Matt Badiali’s latest Jr mining stock hype for $1995.00 to the first 1000 takers? I am sure there are some good recommendations there and you could easily recoup your cost if all goes well. I’m just a little burnt out on getting burned by all of these marketing hype artists. Although this time conditions are ripe for a commodity break out……. booming global economy, falling dollar, metals have bottomed and recovering for the past year. Gold, Silver and Jr miners may have a banner year in 2018. Any thoughts on Matt’s latest recommendations? Guess if I was going to donate $2000.00 I would be better off buying a 2-year LEAP Option on GDXJ. At least some share holder would get the money. Then there is $HL, hecla, which is also a zince proeucer. They produced 12,000 tons in 2017. Byproducts were gold, silver, and lead. Funny how they only talk about the gold and silver. So is Matt a fraud or is he legitimate? Is his membership group for $47.00 worth doing and are there really investments that can bring big returns for only $10.00? So is his pitch about being able to invest even as low as $10. once you join his site for $47. 00 legitimate? Are companies really paying out several times a year with big returns on the investment? Badiali is ramping up the huge amount of shilling that Weiss Research has been doing over the past few months. I took Weiss to task for spamming me, a paid subscriber, with all kinds of junk. I said to them that it appeared that Martin Weiss had gone senile, or some other entity was taking over and they were going to milk the Weiss brand for all it’s worth. Now we know who’s doing that. I still get crap spam from Banyan Hill every day, and it’s always some breathless, new, can’t-miss opportunity from Badiali. Weiss/Badiali – my good old pops caught up with these guys….they wud sign him up for the same letters, charge him more than once. Pops thought he was getting things in the mail rather than email….nothing but frustration for him and me to continually explain, make phone calls and to finally put a stop their harassment of an old man. Criminal what they get away with. So, are you saying Badiali is a fraud? There is ONE! 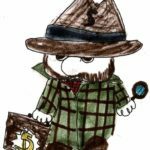 It is StockGumshoe.com period. Long Travis and the #Gr8Gumunity! # Bes2ALL! Travis; After seeing this a few weeks ago I phoned a very good friend of mine who used to be Chief Geologist for HBM-T and he told me he’d just sold part of his shares……around 25%. He also told me he didn’t know where the price of zinc would go. He was in a rush so I didn’t pursue but knowing him, if HBM was so hot a stock, he would be keeping what he sold. I lost $$$ on HBM a few yrs ago and with TECK.A-T as well, another large Canadian zinc miner/smelter. Real Wealth, Super Cycle Trader, Gold Mining Millionaire. Battialdi and Sean Broderick are trying to pick up the pieces. I think yur right. Weiss invents a new mouse trap to get yur $$$$ every 4-6 mths. Hope Banyon Hill aren’t the same but somehow I doubt it. Hellooooo….so, this Real Wealth Strategist is a con????? Can’t find too much actually on line one way or the other but the fact that the FTC has paid out real cash, well….let’s just say I’m confused and hopefully, not out $79 for “joining”. Yeah, Shay … unfortunately, it is a “Buyer Beware” kind of environment we live in these days … but when the buyer reaches the tipping point where their just plain fed up with the seller and his greed, along with his corruption, look for a revolution of the likes rarely seen before in the annals of mankind … and then it will be “Seller Beware”! Moral of this developing story: No, Gordon Gecco, greed is NOT good. I saw the “come-on” and as a geologist immediately recognize the mineral as sphalerite (zinc ore) and googled giant Canadian zinc discovery and found Callinex. Anyway, that was my guess. So, I read all the comments and I am still not sure if it is a good way to invest or not. I feel like Sandra, can anyone just give a simple explanation? Seems like the main freedom check is the extraction of the dollars out of your wallet. Email overload suggesting incredible returns. This seems to appear to be the path of yet another scam artist. Anyone know what is being teased here? Thank you for all this information! I would like to know what “Alpha Trader ( Alpha Contracts)” and “Freedom Checks” from Agora Financial are about! Does anyone know? I googled “magic metal” out of curiosity surrounding what appears to be new mining operations 15 miles north of Phoenix, Arizona. The operation is apparent but the purpose is elusive without any official answers. Although the term “Magic Metal” is the buzzword. What ever happened to $AXTI? Monthly "entry level" natural resources advisory from Matt Badiali, who previously edited the similar Resource Report for Stansberry. Rating: 2.6/5. From 48 votes. Banyan Hill pitches that "568 'Designated Entities' Will Begin Paying Out $34.6 billion to American Taxpayers… On February 1 April 1" -- what's the story?